5 Cups An outstanding, must-play game! Feel free to disagree with the panel's rating, and please don't be offended if you think your game has been underrated! If your game has been rated 1 cup, please don't be offended! It's common for your first game release to get a 1-cup rating, due to the game having a lack of polish and flair -- which is understandable, because you're just getting started! Please understand that the main purpose of the ratings is to help potential game players find high quality, bug-free games to play. You've probably learnt a lot about AGS as a result of making your first game -- so why not use that knowledge to start afresh, and do even better with your next game! Click icons below image, or press left and right arrow keys to change images. Left click image or press up key to zoom in; right click image or press down key to zoom out. Click 'X' or press ESC to close. If the download link doesn't work, please report it. If an image doesn't work, please report that. Non-adventure game Using Adventure Game Studio for something else?! We can't give you any meaningful ratings yet, because not enough people have told us what they thought about this game. If you've played it, why not help out and give us your votes? Mags game on the the theme "extinction"
You can play as Tor or Freja to keep the candles burning or as Hel to blow them out. "The idea is fun. Not bad for a week's work but it's very rough around the edges." This is a good little time-waster, although I found it difficult to get into at first. It gets easier as it goes on, but there is no feeling of urgency for the player.A good effort. 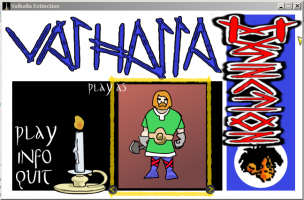 The game runs smooth and the dual game modes give it some added value, but it does seem rather hastily put together and the visual styles of the characters, the candles and the background seem mismatched and clashing. A nice simple little arcade game that made my clicking finger very tired. It was entertaining for what it was, but the gameplay was a little too basic for my taste. I did like how the candles reappear if you can do well for a length of time. 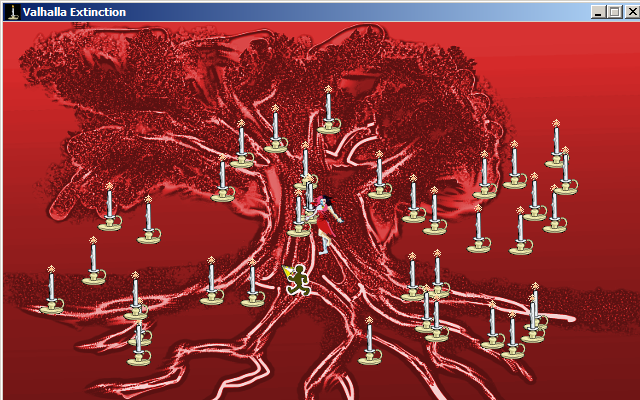 But I felt the gameplay was a little flawed by the fact that all you really have to do is wait until there is only one candle left and then just spamclick on it. 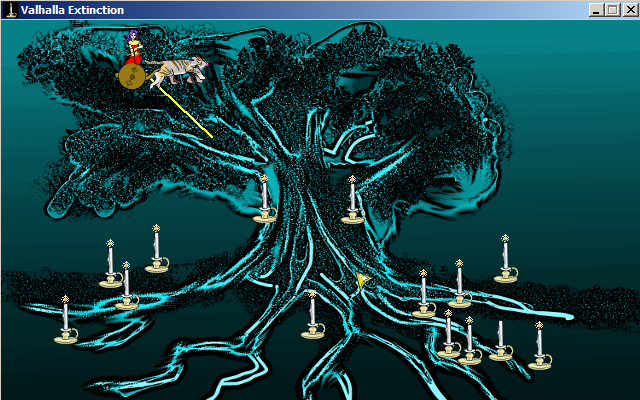 I would advise the creator to make the game end when there are about 7 candles left, so that this cheap strategy is not possible. I also felt a bit let-down that your opponent is not visible on the screen . I can appreciate how hard that would have been to code, but still, it left me feeling that my competitive spirit might have been stronger if I could see the opponent I was fighting against. Overall: A nice effort for the tiny timespan in which the game was created. You must be logged in to the forums to post comments. © Adventure Game Studio 2019. Page design by loominous and Darth Mandarb; coding by AGA.